Dry skin on dogs is caused by allergic reactions, poor nutrition, parasites, skin infections or internal problems. Pit bulls, registered by the American Kennel Club as American Staffordshire terriers or Am Staffs, have short coats, which makes the dogs more exposed to dry skin. Puppies as well as adults are prone to skin problems, including dry skin. Typically, the pit bull's skin is glossy, but if the puppy has dry skin, it has a dull appearance. The treatment depends on the cause of the dry skin. Often, puppies are affected by external parasites, such as fleas. 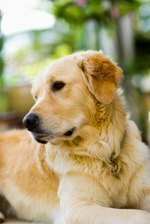 The treatment of fleas involves the use of insecticides or special shampoos, which may dry and irritate the puppy's skin. Once the parasites are eliminated, use oatmeal baths to restore the skin's normal pH. Prevent parasites using flea collars or shampoos that are formulated to stave off parasites. Dry skin on puppies may occur because the puppy doesn't have a proper diet or is dehydrated. Many cheap commercial puppy foods don't contain the necessary amounts of nutrients and supplements that the dog needs to develop and the skin's health can indicate a nutrient deficiency. Ensure your puppy gets quality food and plenty of fresh water. Your veterinarian may also recommend vitamins, digestive enzymes or supplements, such as fatty acids or antioxidants. Lack of grooming, frequent baths or the use of an unsuitable shampoo can lead to dry skin on Am Staff puppies. Bathe the puppy only when necessary and change the shampoo to a gentle, moisturizing formula that won't irritate the skin. Avoid using shampoos formulated for human use, because these are too harsh on the puppy's skin. Brush the dog to spread the essential oils on its skin, which also moisturize the skin and prevent dryness. Colloidal oatmeal relieves itchy skin and may be added to the dog's bath water. Use a humidifier during the cold months to prevent the dryness of skin. If the pit bull puppy is affected by a skin infection, it will require veterinary care and topical ointments that contain antibiotics. In severe cases, oral antibiotics are also needed. Allergies are managed with antihistamines, steroids or allergy shots. If your pet is allergic, identify the triggers and eliminate these from its environment. Internal problems such as liver disease or hypothyroidism may be at the root of the dry skin and these conditions require medication treatment. Consult your veterinarian if the puppy scratches incessantly, has sores, open wounds, hair falling out or foul-odored skin.